Use pumpkins to decorate your home in the fall. Then, pop them in the freezer, and enjoy a year's worth of delicious pumpkin breads and soups. Freezing pumpkin is easy and well worth the small bit of time it takes. Roast and puree your pumpkin(s). To do this, cut the pumpkin(s) in half, and scoop out the seeds. Then, cut the pumpkin into smaller wedges, and place them on a cookie sheet, skin-side down. Roast the wedges at 375 degrees for at least an hour (it may take longer). Your pumpkin is done when you can poke the flesh with a fork and it feels soft. Allow the pumpkin to cool until you can handle it comfortably. Then, use a spoon to scoop the flesh off the skins. Discard the skins (they can go in the compost), and transfer the flesh to a food processor. Pulse the pumpkin, until you achieve a smooth, consistent texture. If you don't have a food processor, you can use a blender or immersion blender instead. Even a potato masher or pastry blender will do the job. You just want to make sure your pumpkin puree is smooth, not stringy. Pumpkin has a lot of water weight, so it's important to drain your puree before you use it or freeze it, otherwise, any recipes you use it in will turn out watery. To remove the excess water, line a colander with a couple layers of cheesecloth, and place it over a large mixing bowl. Then, pour your puree into the colander. Place your contraption in the fridge overnight. In the morning, all the excess water will be in the mixing bowl. Sometimes you'll have a ton of water in the bowl, other times you'll have hardly any at all. It just depends on how wet the growing season was. 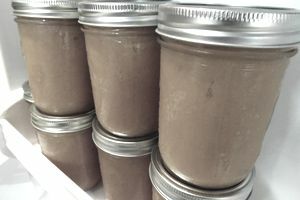 Divide your finished puree into individual servings and freeze. Two cups (one pint) is the equivalent of one store-bought can of pumpkin puree, so it's a good size to have on hand. Be sure to use freezer jars, if you decide to use jars. Regular jars may crack or burst in the freezer. Your pumpkin will keep in the freezer indefinitely but is best used within a year. Thaw your pumpkin puree in the refrigerator overnight or defrost it in the microwave. It usually takes me about 18 minutes to defrost a pint jar of pumpkin puree in the microwave. Yield: Expect to get about one cup of puree for every pound of pumpkin. Two cups is enough for a pie. Don't toss those pumpkin seeds! They're delicious roasted. Pumpkins usually get marked down after Halloween. Pick up some extras to puree and freeze. Small pumpkins that feel heavy for their size will yield the most puree, but all pumpkins are edible. Pumpkin cannot be canned safely with home-canning equipment. Always freeze any pumpkin products that you don't plan to use right away.